Writing regular updates has been hard now that we are on the property, so let me begin Wednesday Writings. Today, I have three HUGE thoughts colliding that would merit a Part 1, Part 2, and Part 3… but with blogs, that doesn’t mean that all three will be read. Therefore, I am going to write these thoughts in punchy bullet form, so imagine more and read less. Sorry if it’s choppy. Mike and I both grew up with committed church attendance and worked in camping, then in corporate churches. This past decade has revealed a lot about corporate American church that left us craving a real-life-living, Church-with-a-big-C, walking-in-the-identity-of-Christ, smaller-and-more-personal way of living. Where “ministry” is “living” and the lines are blurred into the same. So here we are, doing something that is right out of a … HOME. In fact, we also live in this home. As a pastor’s daughter, I often heard people say things like, “It must be hard, living in a fishbowl.” I never minded, and did not care if people saw who we really were. While watching Mike and the kids fish, I realized that most churches are designed more like a fishbowl than a way of life in a lake or an ocean. Jumping out is hard, so some won’t ever jump, even if life and faith are stagnant. Though for many, over time the size or discomfort of the fishbowl will cause people to make a jump. But many discover that being in the new place is really just being in… a bigger/different fishbowl. Bigger just staves off the feeling of dissatisfaction for a little while longer. Perhaps the dissatisfaction is less about the style of the fishbowl and more about living an active faith. of a fishbowl, life is alive and activity is constant—you work to eat, you school, you GROW. the same water, with your faith in a life of active obedience that displays evidence of an Almighty God? 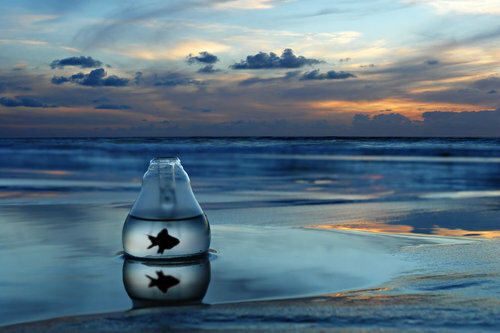 In a fishbowl, growth is limited. A bigger fishbowl may make a bigger fish, but imagine the growth in a pond, a large lake or even the ocean… and the influence in that current. A woman the other day told me that she knew it was time to leave where they were attending when she started to notice that she would stand in the foyer of their church, surrounded by people she knew, and twenty minutes would pass without anyone looking at her or saying her name. Now their family is swimming in a place of personal growth, seeking God’s design and purpose for each one in their home and neighborhood. They are reading the Word for themselves for the first time in their lives, and learning to pray as a family. It is so exciting, and we see them evidence a walk of greater purpose, carrying their shoulders higher, and adorning their faces with smiles and fresh stories and conversations from daily life. It’s refreshing, and their faith is no longer in a fishbowl! As families are getting used to one another in this more personal way, while not segregating the age groups, a few feathers have been ruffled. At the same time, we have been watching a mama goose and her gander learn to live in community with all of these new humans on the scene! The goose was building her nest, and laying her eggs in front of Cre8Home, right by the water, in a place where she most likely has laid her eggs for years while this property was vacant. It was a challenge to communicate to our fine-feathered friends that we are not trying to harm their little ones or step in on their parenting. We just need to grow together in healthy shared boundaries, and live in peace. individuals soar in due time. Okay, so here is another surprise! We have a Kernersville address. A few properties down the road begin a High Point address. Where they come together, there is a four-corner stop called Horneytown. Yes, Horneytown! At that four-corner stop, you can visit the country store and leave with chewin’ tobacco, live bait, and a gallon of milk. There is a small hut with a sign that says “Guns & Ammo.” And on the other side of the street, there is a building that I thought was vacant, once a gas station. Well, it is actually Tucker’s Grill, an incredible lunchtime breakfast and burger joint where the locals eat (camo required). We have been experiencing an increase in people coming right to the door of Cre8Home to meet us, and they are friends of all ages who live in the Horneytown community. Before the Civil War, all of this land was owned by the Horney Family, thus the name. The people here are friendly and want to be able to wave at their neighbors. They have come here to meet us and shake our hands, thankful that we are seeking to save this piece of land from becoming a subdivision or shopping plaza. A college-aged young man came by, offering to bring his father and their big equipment to clear brush and help “with anything ya’ll need.” We have regular visits from Gloria to fish with her grandkids. When I invited her into the home to exchange phone numbers, she was stunned at the invitation, saying, “I have never been inside this house before.” Big Man Lloyd comes to fish, too, and Sadie chit-chats, of course. She walked right up to him and said, “Mr. Lloyd, you kind of remind me of God.” He looked at her perplexed, and she finished her seemingly random thought, “You know… LORD? It’s like Lloyd!” And as she bounced away, I saw him smile. I could list many more new friends—they all come back, smiling a little more. This all seems disjointed in a blog, but we are praying the Word of God over this entire endeavor, over the local community and the people by name, asking God to guide the integration of families and generations. We wonder exactly what this place will look like months and years from now, and we pray for God’s Provision to make us able to stay here and to see it all through. We have had requests for building mountain bike trails and retreat spaces. We have a vision for the short term and for the long term that will include community gardens, an artist studio, a music studio, walking trails, and more. This little groundhog is happy that we have not started in the garden. Anything we begin, though, needs to be maintained. That means that if a garden is started, the floors must still be swept. So right now, we are doing what we can with what we have, and that means small gatherings and big-fish-catching… and the people come. Coffee is served. Connections are being made. A Community is being built. And it will take a community to serve the community. We love how eclectic it is, and most nights we have to remind ourselves that this is not a dream, nor is it a story. This is real and this is life. More on that another time… Today is Wednesday, and writing is done. Now the rest of the day needs to be lived. There is no fishbowl. Just life.